What’s your New Year’s resolution? The same question is asked every single year on the same day. January 1st is fast approaching. 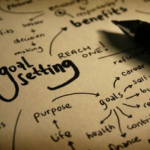 Are you ready to start achieving your goals? For the month of January, we will be talking about the New Year and how to create a year-long game plan for yourself to follow. New Year’s resolutions aren’t just for show, they are for improvement of your life. Think of these resolutions as goals you can feasibly reach. For example, if you want to stop drinking soda every day, don’t tell yourself that you are going to stop[ drinking it all together. Rather, Reduce your consumption gradually, week by week throughout the year so that you consume less over time until you’ve reached you’re goal. This way, you are not feeling a sense of deprivation while slowly achieving your goal. Here are some resolutions that are achievable. Keep in mind that these can vary by degree. You can go move quickly or gradually by month. Either way, set a goal that you can achieve and feel good about at the end of the year. This is the number one goal for almost everyone on January 1st. “I’m going to start exercising every day this year!” The gym is packed for the first 2 weeks of the year and all of the regulars are annoyed with the brand new, optimistic fitness lovers. However, the excitement fades as you realize that your busy schedule just can’t accommodate 6-7 days every week. So your workout dwindles to a couple days of the week and eventually to zero because you can’t accomplish your initial goal. 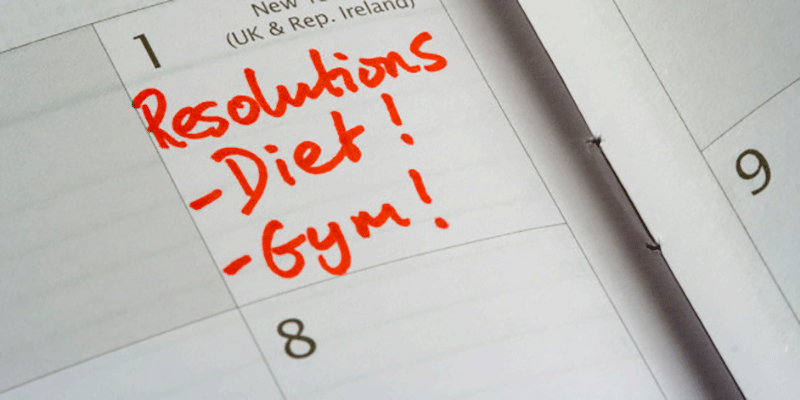 A fitness resolution should be one that you can manage! Make your goal to exercise for 2-3 days a week to start. Then, you can gradually increase the frequency as you open up your schedule. Let’s be honest, that hour session on the couch when you get home from work could definitely be replaced with exercise. Small changes in the right direction add up. Commit to owning your choices and taking care of YOU. Changing up your diet can be very difficult because the way you eat and cook becomes a comfortable, familiar routine. Start by cutting out one piece of junk food a week. Then two. Add a vegetable to your lunch every day. Give yourself a “cheat” meal if you are feeling overwhelmed… the key is to view everything in moderation. Replace the soda you drink with water. It all starts at the grocery store. Stick with the list! Your wandering eyes can get the best of you. Plan out your healthy meals and snacks and write down what you need at the store, and ONLY buy those items. A favorite trick is to limit my shopping to just the perimeter of the grocery store. Here’s something surprising. Nearly all of a grocery store’s processed foods are stocked on the internal aisles. 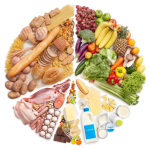 Therefore, shopping the perimeter of the store entices you to stock up on fresh fruits, vegetables, and lean meats. And, many fruits and vegetables are anti-inflammatory which can ease joint and arthritic pain. Feeling more accomplished in the New Year can extend to others beyond yourself. . 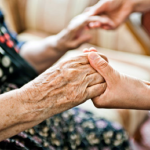 Helping others can make you feel better and make a huge impact on your community. For example, volunteering a few hours a week at a soup kitchen, local animal shelter, church/religious institution, or other organization is a great way to meet new people while immersing yourself in your community. You can make these resolutions become a reality any time of year! Whether you are new to exercise or making small modifications to your dietthis year, you can more likely achieve small goals, one at a time. Don’t give up if you miss the mark at times. . Start by writing your goals down somewhere safe so you can go back at the end of every week and review what you’ve accomplished. Keep frequent tabs on yourself, and note you’re achievements whether they are big or small. This provides the momentum to continue. A commitment to improving your life will be the most important decision you make…so make sure you set yourself up for success! Posted in Blog, Diet, Exercise, Holistic, Self Management.